The ‘Learning Management Solution’ (LMS) incorporates a fully interactive suite of training and information modules, available on the internet via a desktop, tablet or mobile device. The system works remotely, meaning it can be accessed at a time and place to suit the user. Each interactive module makes learning simple, ensuring all staff are fully trained quickly and to a very high standard. There are eleven learning modules available which cover COSHH, Health and Safety, Colour Coding and Infection Control, Carpet Care, Kitchen Hygiene and Floor Care, Introduction to Equipment, Washroom Hygiene, Housekeeping, Manual Handling and an Introduction to Cleaning. 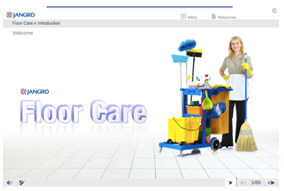 At its launch at the Cleaning Show 2013 the Jangro LMS and mobile app was entered into the Cleaning Show’s Innovation Awards and the great news is not only did it triumph in its own category but also won the overall winner's trophy. The LMS system works remotely so it can be carried out at times to suit the user. Programmes' operating times vary from 50 minutes, to 90 minutes for the very detailed floor care module. Users can dip in and out in short sessions to suit ? maybe 15 minutes a day ? so learning is easy. All LMS modules come with range of online COSHH and technical data sheets, risk assessment and product usage guides, animated instruction on everyday tasks and an 'Ask the expert' interactive source of information. Employers and training managers can remotely monitor employees' progress and check on the progress of each employee. 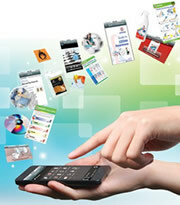 For more information about our LMS system please click here.